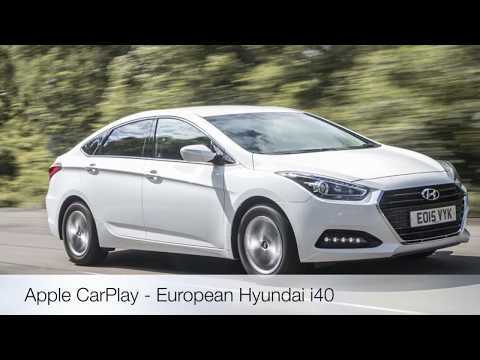 Recently, I began looking into how I could get Apple Carplay installed on my 2016 Hyundai i40. I could see Hyundai UK were tweeting that a free software update was available for any SE Nav model since Nov 2015. However, unlike our US counterparts, this was not a publically accessible upgrade. It must be done by a Hyundai dealer. As a software engineer myself, I thought I’d search the web for a way to carry this out myself, since I was pretty sure that once I could get the firmware files, I would be able to figure out how to install the update. WARNING: If you carry out this car firmware upgrade, you do so at your own risk. Update: according to the forum auther, @Sernaiko, this is the original Hyundai firmware, and has not been modified in any way, so, in theory, the risk should be minimal. A USB Stick (1GB or more will do). Formatted for FAT32. A PC to download the firmware. The current version of software on your vehicle. To find this out, on your car touchscreen, go to All Menus>System Info(scroll to the bottom to see that) and then take note of the “S/W ver.” field. The version should begin with ST.XXXX. Note the letters after ST. Note: I took a video of the in-car parts of the procedure and posted to youtube here, which may be of help. Download and extract the firmware files from here. Also backed-up here. To know which one to open, take a look at the version on your vehicle at present. That will determine which folder you want to use. For me it was vfsdia. So, I looked inside the st_vfsdia folder and saw an update folder. Insert your USB Stick into your PC, and ensure it is formatted as FAT32 (most memory sticks already are). Copy the update folder directly over to the USB Stick. note that you should not use the car navigation SD card for this, as it will not work for a system update. At this point, when you look at the USB drive on your PC, you should see the update folder at the root of the drive. Eject the USB stick from your PC and go to the car. Insert the USB stick into the usb slot in front of the gear stick. On your car touchscreen, go to All Menus>System Info(scroll to the bottom to see that) and press the Update button. Confirm the popup by pressing the OK button. Sit back and relax. The update will take 30-40 minutes in total. Ensure you leave the engine running all the time during the update. After about 10 minutes, you may see a system error (code 109), as I did. You need to remove the USB stick at this point. Now use your ballpoint pen to press the reset button for 5 seconds. The reset button is tiny and you can find it just to the right of the CD slot above the touchscreen. The reset will reboot the system and continues the upgrade. The USB stick is no longer needed from now on, so you can put it away in your pocket. The update will take another 20-30 minutes, so head away and grab a cup of tea. In the end, you will have the latest firmware installed and you can plug in your smartphone to enjoy Android Auto or Apple Carplay. Note I take no credit whatsoever for the firmware. It was not created by me. I simply downloaded it and followed Google translated instructions from users @Sernaiko and @raler over at drive2.ru. Thank you to those guys for sharing the details on how this can be done.